Anko Dango ('あんこ団子[ダンゴ, だんご]', is classified into sweets), is known as Dumplings with Red Bean Paste in English, and 红豆沙团子 (Hóngdòu shā tuánzi) in Chinese. It is the Japanese style sweets. 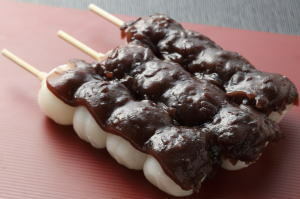 Skewered Red Bean Paste Dumpling, Red Bean Paste Dumpling Skewer. Glutinous Rice Flour (Rice Flour), Sugar, Red Bean Paste.